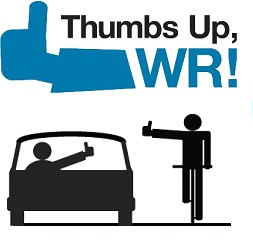 Thumbs Up Waterloo Region is a community campaign directed to both cyclists and motorists, and aims to improve road safety through education, engineering, and enforcement while fostering a community culture of sharing the road. With more and more cyclists on the road each year, this campaign emphasizes the importance of working together to create a positive experience for all road users. Thumbs Up WR returns in June of 2015! More radio ads, more bells, more tweets, more places to go! This collaborative working group of stakeholders is creating a strong foundation for positively influencing active transportation in our communities. Learn more about our Partners, view our Resources to launch a similar campaign in your community, and Join the Conversation to get involved in future initiatives. Remember, we all have places to go. Give a thumbs up and let’s all get there safely.